I walk out to water my tomatoes in their topsy turvy bags and discover my almost ripe big beautiful tomato missing. Then I spot it. Its been plucked by animal and gnawed on! I waited several weeks for that tomato to get ripe. Darn. I pick the other nearly ripe ones hanging close to the ground, so they can ripen in safety in the house. I gaze at the gnaw marks and wonder if its a raccoon or possum. Both these varmits roam the neighborhood. The next day, I bring my little video camera outside to take pictures of my perfect jalapenos. The tomato is half gnawed at this point. Some animal really likes that not quite ripe tomato. I begin my video of the jalapenos closest to the tree trunk. The jalapenos are in a multi-hole bag with strawberry plants. As I step to the east to get video of my jalapenos hanging over the grass, an object appears in my peripheral vision near my foot. I look down. 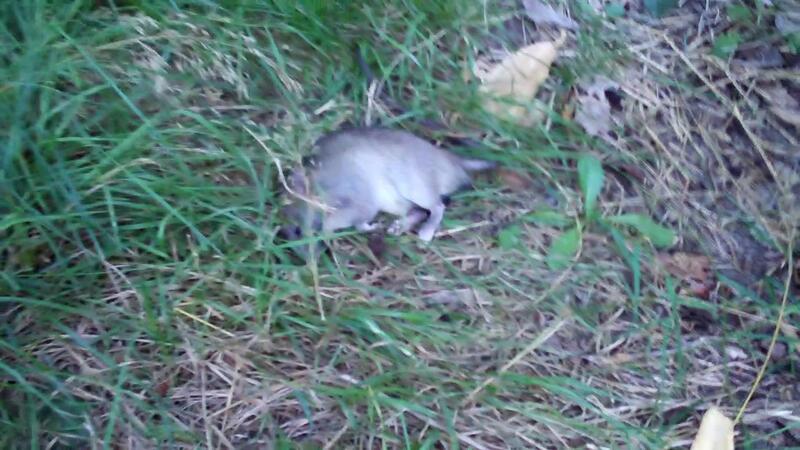 Its a dead rat! I scream and do the dead rat dance, that horrified mincing step. My tomato is rat gnawed! All the fuss attracts JJ’s attention and he tentatively approaches for a closer look at the corpse. I wave him away so I will not get any dead rat spiked dog kisses. I gather my wits and sigh. Jack would tell me to dump the body in the yard waste bin. I imagine the stench and opt for burial. Digging the hole takes twice as long as planned due to tree roots. I gingerly pick up the stiff body with a shovel and dump it in the hole along with the half eaten tomato. Are tomatoes bad for rats? The body and half eaten fruit are only 8 feet apart. Is it a coincidence? Could my tomato really be the killer or just the last dessert of a poisoned rat? Posted by kriskkaria on September 27, 2014 in Comedy, Humor and tagged crime, funny stories, funnystories, killer, rat, tomato. Hi, I'm Kris. A narrator, actor, voice actor, and writer. I've impersonated a cat, a prince, a princess, a witch, a madwoman, and a president with my voice and narrated/produced over 40 audiobooks. I narrate and produce an award-winning weekly storytelling podcast showcasing stories from fantastic writers. Visit my IMDB page for stage and screen credits. He didn’t look Italian, but you never know. You should have buried the rest of the tomato with Mr. Rat, ha ha! As soon as I read “Killer Tomato” the song from the movie went straight to my head. I had to go to the YouTube video of that, its hilarious. I thought you would have a good chuckle.